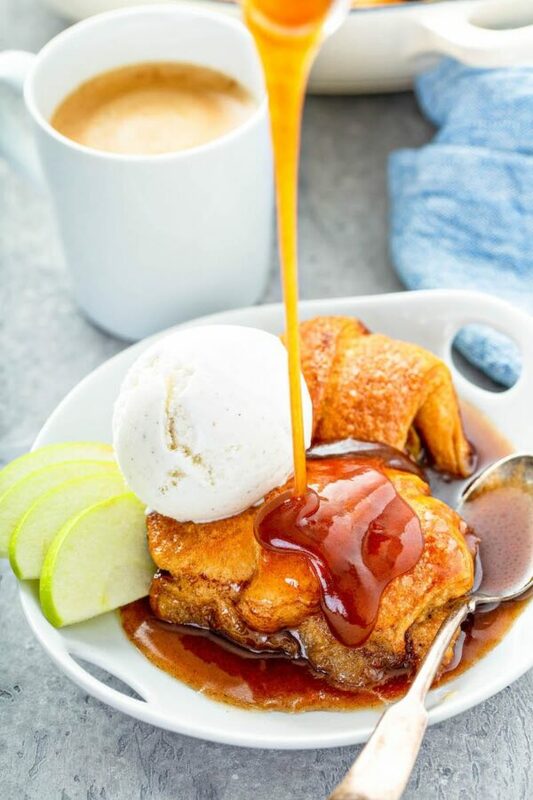 Rum Apple Dumplings: rum soaked cinnamon spiced apples are wrapped in tender dumplings, baked in a sweet buttery rum sauce and served with vanilla ice cream! Are you ready for my new favorite dessert of 2019? Here it is! 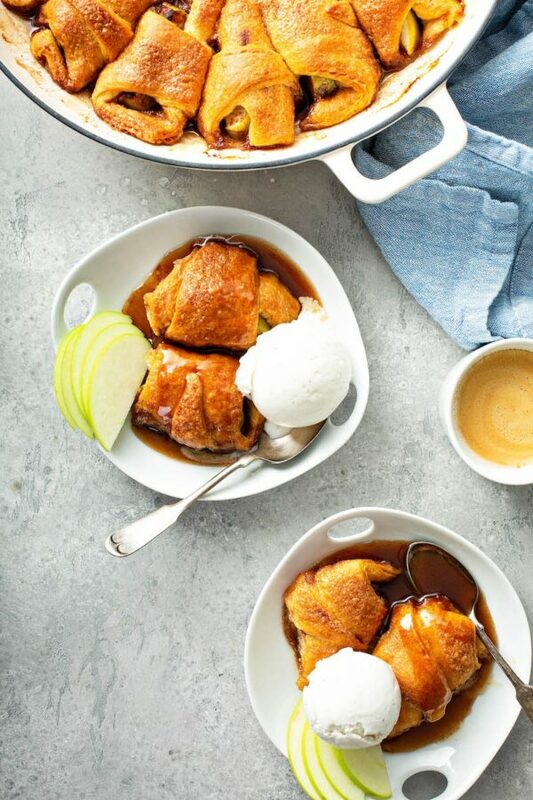 Truly epic Rum Apple Dumplings! I have always loved apple dumplings. 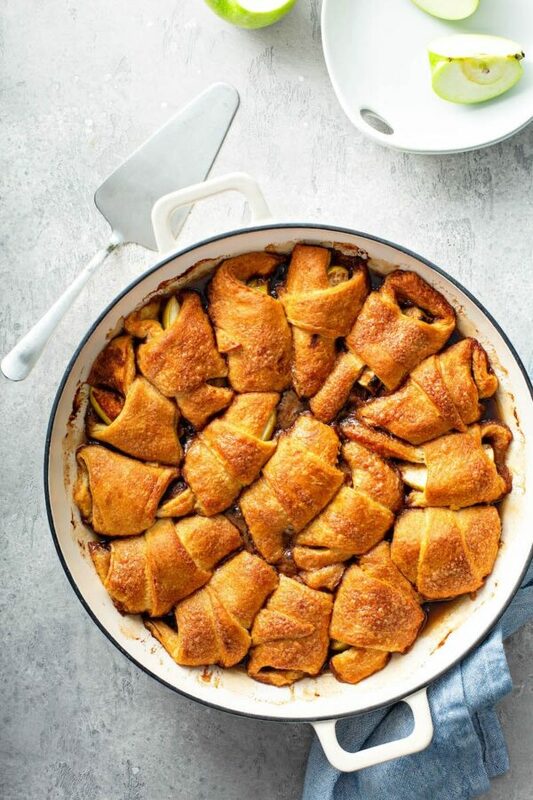 Even the classic version — Mountain Dew Apple Dumplings. Soft baked apples spiced with cinnamon, wrapped in tender dough and a rich sweet sauce? Sign me up! A few weeks ago I was making dumplings for a big family dinner and I decided to add some rum to them. I soaked the apples in rum and then added a little rum to the sauce as well. WHOA. There was not a single bite left in the house! 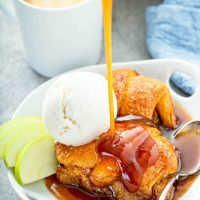 You seriously must try this Rum Apple Dumpling recipe asap! For the dumpling dough, I use crescent dough. I am going to be honest with you, I have tried making my own dumpling dough from scratch and I just don’t think it’s as good. I see no point in going through all that work for subpar dumplings, when you can use crescent dough for excellent dumplings! On another dumpling related note, you may already know, but I am dumpling obsessed. I even have a couple of savory dumpling recipes: The Best Chicken and Dumplings and Homemade Chinese Dumplings. Ok, it might not have won any awards besides those given away around my kitchen table, but this dumpling sauce really does deserve all the awards! Let’s look at the ingredients shall we? Butter, brown sugar, granulated sugar, cinnamon, apple cider and rum. With ingredients like that, how could it not be beyond amazing? I like to use a spiced rum, but you can also use a clear rum. However, I would not recommend using a flavored rum. Let the flavors of the dish shine through just as they are, you don’t need any extra flavorings. Just like I like my bread pudding with vanilla ice cream, I like my apple dumplings with it as well. That doesn’t mean you won’t prefer whipped cream though! Try both and see which one you like best as a topping. I think cold vanilla ice cream in contrast with the warm apple dumplings and sauce really is the perfect pairing. It adds an overall richness to the dish that I just don’t think whip cream can bring. This recipe is easy to whip up and will be sure to impress all of your guests. I assure you there will not be any leftovers of this dessert! If you have kids joining you and are worried about the alcohol content, don’t be. It cooks off while baking in the oven! However, if you are still a little nervous, you might prefer to make my Mountain Dew Apple Dumplings instead! I can’t wait to hear how this Rum Apple Dumplings recipe turns out for all of you. Make sure and leave your review below! Oh! And don’t miss all my other must make dumpling recipes! 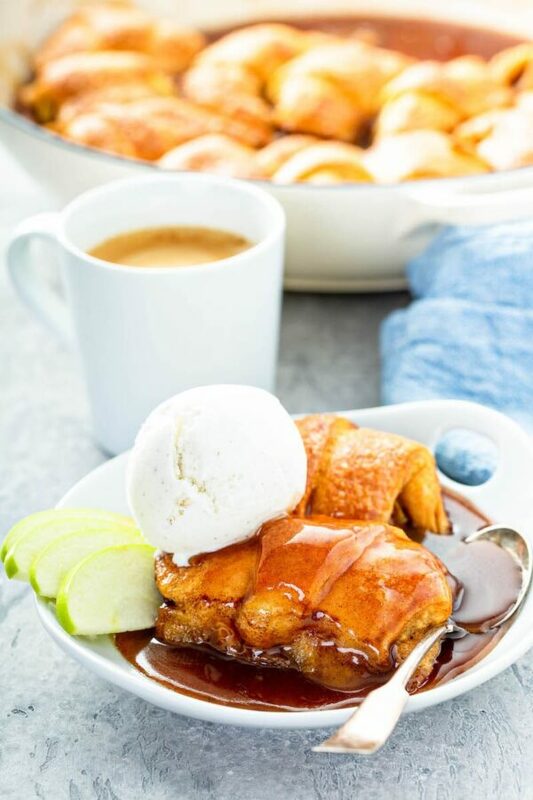 Rum Apple Dumplings: rum soaked apples are wrapped in tender dumplings and baked in a sweet buttery rum sauce. Serve them with vanilla ice cream for the ultimate dessert! Core and slice apples into 8 even slices (16 slices total) and then peel the skin off the apples. Place apples in a ziplock bag and add rum. Marinate for 1 hour. Preheat oven to 350°F. Grease a 9x13 baking pan (or extra large cast iron skillet) set aside. Sprinkle cinnamon (about 1 tablespoon) on top of all of the apples. Then roll one apple slice inside of each crescent roll piece. Place in prepared pan, in two rows, leaving a little room between each dumpling. Then in a small pot bring the butter, 1 tablespoon cinnamon, granulated sugar, brown sugar and 1/4 cup of the reserved rum to a boil. Once boiling, evenly pour over the crescent rolls. Finally pour the apple cider around just the edges of the pan. Bake for 40 to 45 minutes, until bubbling and the dumplings are browned on top. 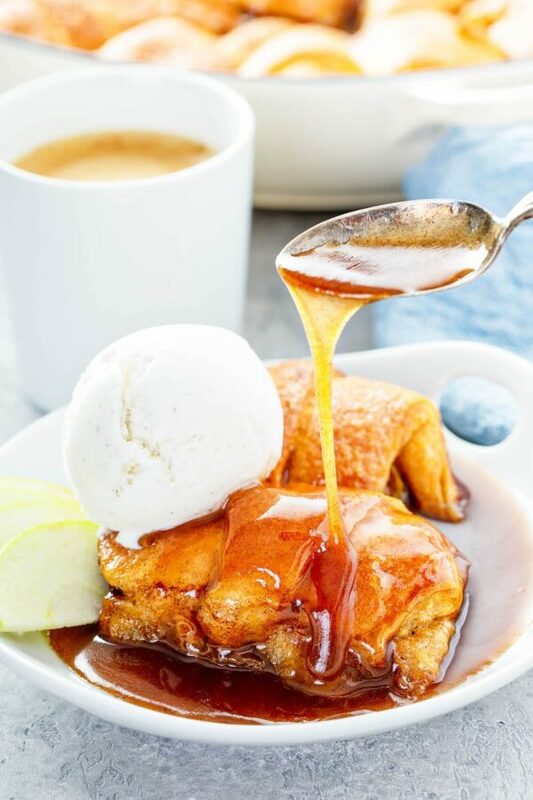 Serve hot with vanilla ice cream and pour the extra sauce form the pan on top!